The Queen is always dressed for every eventuality, after all, her royal engagements could take her anywhere. Of course, the chance of a sudden downpour is not uncommon in the UK. The Queen’s umbrella of choice is a birdcage-style, clear umbrella created by Royal Warrant holders, Fulton Umbrellas. The umbrellas have to be transparent, so crowds can see her. 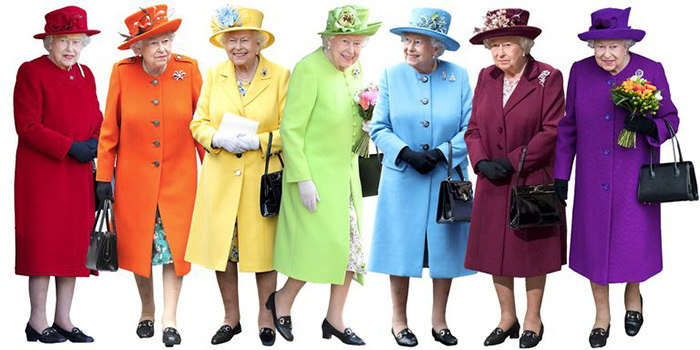 In advance of an engagement, the Queen’s senior dresser sends out a colour swatch of the outfit she’ll be wearing and they then create an umbrella with a perfectly matched trim. As well as the chance of rain, the wind can also be an issue. The Queen’s team test her dresses and coats using electrical fans to evaluate the movement of the fabric. If the fabric moves too easily, they sew in small curtain weights into the hem in order to provide more structure and sturdiness. Some Royal events can be quite lengthy, so it’s important that the Queen’s outfits are both practical and comfortable. Every aspect of her outfit is precisely considered to ensure that she looks polished and flawless. Since the Queen regularly travels by car, lightweight fabrics are often unsuitable as they crease easily. Therefore, each outfit is made from a crease-proof fabric in order to keep her clothes looking fresh and perfect even after a lengthy car journey. To keep her feet comfortable, the Queen wears 2.25-inch heeled shoes with insoles. Her handbags are also very well thought out. As her engagements often require her to shake hands, she prefers a bag with a long handle – namely Launer’s Royale and Traviata bags. Because these handbags feature a longer strap, they don’t interfere with handshakes or her preferred three-quarter sleeve length. But what does the Queen keep inside her handbag? That remains a mystery unfortunately, however, rumour has it that she carries a compact mirror, a fountain pen, reading glasses and mints. The Queen supposedly only carries cash on Sundays – in the form of a perfectly folded £5 or £10 note. We’ve covered the shoes and the bag – what about the Queens hat? As expected, her headwear is also carefully thought out. Rachel Trevor-Morgan, the Queen’s preferred milliner, creates bespoke hats that are designed so as not to obscure her face and are just the right height for easily entering and exiting a vehicle. The Queen is well known for enjoying a colourful wardrobe – but have you noticed that you never see her in the same colour at consecutive events? This is because her majesty has a team behind each one of her outfits, who choose the colour based on factors including when she last wore a similar shade and the nature of the event. For example, if the Queen was to visit a leafy area or park, she would avoid shades of green as they would cause her to blend in with her environment. Instead, the Queen wears colours that help her stand out from her surroundings, which in turn makes her easier for crowds of people to see. The Queen also has a team of dressers, who keep handwritten notes of all the outfits that she wears. This allows them to keep track of everything that she wears and what occasion she wears it for. As the Queen will sometimes wear outfits more than once, this process ensures that they’re worn on a strict rotational basis.